I carry a knot of sorrow in my chest. 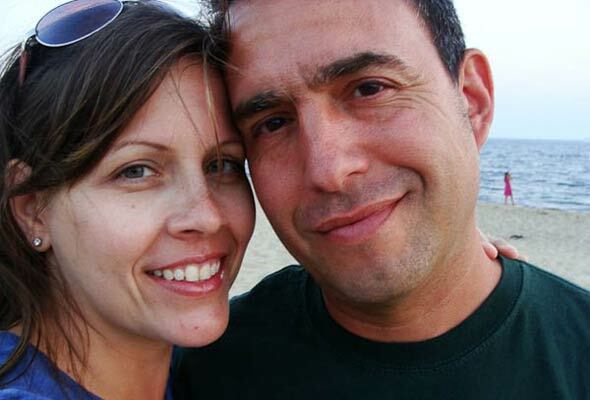 It started tightening a week or so ago, when I learned that food blogger Jennifer Perillo‘s husband, Mikey, died suddenly of a heart attack. That’s him on the right. I’ve never met Mikey, and I’m embarrassed to say I can’t remember meeting Jennie. A conference, perhaps? A party? I do know we’ve tossed a few bon mots back and forth on Twitter, but that’s about it. Mikey leaves behind a woman too young and vivacious to be a widow; two small daughters too innocent to lose a father, a protector, a prince to their princesses. Plus bills, obligations, half-read books, good intentions, a Blackberry that needs charging–the evidence of a lived-in life. My sadness is fed in part by my lack of connection to what appears to be, and what I’ve heard is, a loving family. Jennie, Mikey, and I could have been friends. Maybe. There were 140-character overtures blinking on my Twitter feed, but I mostly politely ignored them. Perhaps the Perillos and The One and I might have gone out to dinner, us picking apart the meal like the food savants we think we are. If we were friends, maybe I might have given their daughters an airplane ride like Mikey used to do. I never pursued it–too busy was I. My sorrow is most palpable when I realize I make so little time for the people in my life. I’m constantly chained to my desk, to this god-forsaken computer. “Tomorrow” is my mantra. Just ask The One, who eats too many meals alone, sits by himself in the living room at night reading, goes to gallery shows and plays and musicals with friends. All because I’m working. Always working. A few friends have fallen away, I know, but I’m too preoccupied to feel the emptiness left by them. I thought of Jennie and Mikey a lot this weekend. If The One suddenly died, what would I be left with? His Fiesta collection that threatens to overtake our kitchen, the Shaker chairs whose seats we insanely decided to weave by ourselves, the neat pile of photography books on the left side of his desk. Things. I’d be left with things. But not enough memories. Never enough memories. Not even photographs, because, since I’ve gotten fat, I stupidly forbade any pictures of us, putting an end to the visual reminders of the narrative of our life together. And the worst, if he passed there would be too few close friends to lean on. It takes only a second for life to change irrevocably. One moment you’re a wife. The next, you were a wife. Or a husband. Or a mother, father. Or son, daughter, lover, friend. I know I must wring dry every moment of time I spend with those I love. I must push back from my desk at 6:00 p.m. and make dinner for The One. I must refuse to work on the weekends. I must slow down. I have Jennie–a woman I don’t even know–to thank for that realization. Love has always been on the clock, ticking down for all of us—even families like Jennie’s that clung close, played together, breathed in each other’s worlds. Some dear friends of Jennie’s have helped create “A Fund for Jennie” (#afundforjennie) to collect donations for her and her little girls, Isabella and Virginia, through the non-profit organization Bloggers Without Borders. Bills are piling up, the weight of single motherhood is pressing down. If you’ve experienced the kind of loss Jennie has or, like me, want to cling fully to life and to those you love, won’t you please donate to A Fund for Jennie? Just click on the button below. It’ll take you straight to the secure PayPal account. Every little bit helps. Please note: The donations are closed. Photo © 2011 Jennifer Perillo. All rights reserved. Absolutely lovely David. Jennie and you will love each other. And I know you’ll finally meet soon. Sometimes tomorrow has to be today. mom101, I hope so. I remember that casual, almost non-introduction introduction we had at DiNoto that led to many conversations, tweets, and smiles. I’m glad I didn’t pass up the opportunity to STOP and meet you. Thank you for sharing this sorrow so that we can all somehow help with however much we can. I would have never known about it otherwise. Sofia, thanks for your kind words. I hope the story of Jennie gets out to all of our readers, and we can help her. There are bills, insurances, mortgage, all the never-ending obligations that have no regard for death and loss. Maggy, thank YOU for creating Bloggers Without Borders. You are a firebrand, and it’s so wonderful to see your work helping people. i am so thankful we sat next to each other on the plane that night last fall . . . you are such a gift David, such a rare gift with enormous talent and a big heart . . . thank you for being so raw and honest . . . this is a post i won’t soon forget. As am I, Smith Bites. A simple, casual thing such as sitting next to a person on a plane can open up a whole new world and friendship. As with mom101, I’m so glad I took the time. David, thank you. This really hit home and I truly appreciate it. Let’s hope it encourages people to give, Terri. Thanks for a great post, David! I have been struggling with words lately and have been hugging my husband and kids more since learning of Jennie’s horrible loss! Thanks for being so kind to her and posting this. I have donated! Heather, I’m glad it touched you. And thank you very much for donating. It means a lot to me, and I’m sure it will mean even more to Jennie family. I love you David Leite! And I love that you are helping us help Jennie. This is the proof that there are Bloggerss Without Borders, just as there is love without borders. Thank you, Karen! May this encourage all of our fans and readers to donate. What a beautiful post, David. You’ve managed to put into words what’s been in our hearts all this time. David, what an incredibly introspective post. Thank you for sharing your honesty, vulnerability, and incredible heart with us. Hugs to you and The One. And yes. Do step away from your desk a little bit more. You and your loved ones deserve the time! Brooke, The One and I thank you for your kind words. I’m glad the post touched you. Let’s hope it touches so many more to help Jennie. Ironic how in this unexpected way food continues to soothe the soul. I’m sorry to hear of this tragedy, and will try to help Jennie in some way. Thank you for sharing this story and nurturing this community. Yes, food is the great healer. I believe that, although at times my faith has been shaken. Any way you can help will be appreciated, Rayna. David thank you for saying what most of us only ever think…and for being brave enough to say it to the world. We do need to make time for the people in our lives. Thank you for taking the time to reflect and post a comment, Wendi. Lovely piece, David. But for this post, I might not have known about this donation effort–and I’m donating now. Thanks for leading by example, as always. My pleasure, or should I say OUR pleasure. And thank you for donating. Roberta, wow! You certainly got it down. Good for you. And may you enjoy all that love and happiness for a long, long time. david, dearest david, you said it all. i had the same feelings as you when i heard the news. i come up with every excuse in the book not to do *it*. whatever *it* may be. thanks for the reminder to be more present. Susan, thanks. Yes, living in the present, fully in the present, is the only way. But even I fell off the wagon last night–only hours after having wrote this. Jennie tweeted asking if I pushed away from my desk at 6:00. I confessed it was more like 9:30. At least The One wasn’t here. David, thank you for this fresh reminder to make more time in our day to day lives for those who are closest to us. I’ve been hugging my little ones even closer since Jennie’s loss, but needed your nudge to close the laptop and turn off the phone – tonight. Aimee, it was my pleasure. Let’s just hope the donations and auction amount to something sustainable for Jennie. I’m forwarding this post to my husband. I use to sit here angry — so angry because my husband was always working – six days a week, 14 hour days. I would get frustrated until Jennie’s loss made me realize that my husband would be coming home that night and then I started feeling grateful. In the last two weeks, we have made a decision to choose a better lifestyle for us. He doesn’t want to work like he has been – and missing out on our son’s life. Hopefully, within six months to a year – our goal will be reached and we can enjoy time together. Your piece really struck a chord – a reminder to embrace and enjoy life. Thank you. Jenny, I’m so glad you could share this with your husband; that he’s still here to share it with. I love the idea of creating a 6- to 12-month plan of changing your lifestyle. Such a smart, careful way of changing your future. P.S. Just ordered your cookbook – looks wonderful! David, thoughtfully and beautifully said. I hope you make your dream come true. Holy cow, David, this post speaks to me with the volume turned up high. We both work all the time and like you and others who spend too many hours working, if he died I’d be left with a lot of things. I hear you, Maureen. Push away from that desk! Sad story indeed, but so lovely to see you care about your writers and their families, and such a nice gesture. I’ll tweet it and facebook it out. Thanks for your heartfelt piece. We get so busy with ourselves that we often neglect loved ones. I got news that my trip to a food conference in Copenhagen might be sponsored Monday. After that I checked flights to share with sponsor and found out cheapest one from NY was via Paris. I then read your piece on Jennifer. It told me that I should try to have a 2 day stopover in France long enough to pay a short visit to my mother and my grandson. Thanks for taking message out of the bottle. Serge, you’re welcome. My advice: See if you can make it three days. You so eloquently stated the things I’d been thinking. I did make a peanut butter pie for Mikey (and gave my husband the world’s biggest hug)but am ready to do more. Bloggers without Borders is genius, too. I hope that somehow Jennie can take comfort in the fact that her loss has so profoundly impacted so many people. Rosemary, wonderful! I hope you–and all of us–donate what we can and follow Jennie’s story. She will need our help not just for today but for a while. Beautifully written. It’s one of the few posts that really touched my heart. Damn you for making me cry, but thank you for the reminder. As someone who’s been no stranger to loss; these sharp notes that hit us personally and indirectly throughout life are poignant reminders about the way we want to live our own lives. I hope you find a balance, David, and it’s not fleeting because it’s very easy to regret later. It is wonderful to see so many internet strangers and friends coming to Jennie’s and her family’s aid, and I’m deeply touched that there is a soulful community beyond the words and images of our screens. Thank you for writing this, David. Thank you for your words, Elina. I hope your loss isn’t too painful or too recent. What struck me about what your wrote was the notion that the balance not be fleeting–that is sustains. The One has told me over and over again that three days does not a pattern make. I’ve always been a sprinter, not a long distance runner in life’s challenges. It has plagued me all my life. But this has shaken me, as it has shaken so many in our community. Thank you for the comfort. It’s difficult to hold on to all of our connections in a way that is meaningful. This is why we write. This is what makes the process so powerful. We touch lives through our contributions. We support each other through comments, tweets, links and mentions. It is a system of virtual hugs and acknowledgments. I thank you for allowing me to belong. Now, go hug The One! p.s. We have yet to break bread. Maybe at Greenbrier? Melissa, thanks for writing. i do so hope all this awareness help encourage readers to step up and support Jennie and her little girls. And, if I may note, act on it. Hand to heart, bowed head. Sent my donation and noted in the “special instructions” that I was referred by you. Greg, I’m so touched that you helped out. Thank you. i know how much you love your son and family, they’re precious. David, I am so touched by your willingness to be vulnerable. Sometimes it seems as though tragedy happens so that others can avoid it. Those terrible wakeup calls of loss and grief can be the catalyst to transforming us. Thank you for reaching out across the miles to all of us. I think you might have more friends than you realize. Not fair. Your comment made me cry. Especially “I think you might have more friends than you realize.” Sometimes being behind this computer everyday, seven days a week I lose that sense of connection. Thank you for reminding me. Crying is good sometimes. It cleanses us. If it weren’t for the computer, I never would have found you. I was researching my Portuguese roots on LusaWeb, if you recall, and I’ve considered you a pal ever since. What a wonderful outpouring. I am reminded of the day my husband died of sudden cardiac arrest. We had spent so much time saying that someday we were going to travel, or visit a restaurant, or follow our dreams. I realized that some day can disappear overnight. I told myself to stop waiting on some day and go for it. I have traveled, and eaten great foods and now know that the joy’s of some day and of sharing that with others isn’t something that one needs to wait for. Sharon, I’m sorry for your loss. I agree with you: Stop waiting. I’m past the half century mark (ouch, that hurts to say!) and somehow I’m still waiting for my life to begin, for things to get in order, for the time to be right. It’s so weird. It’s reminiscent of the summer between high school and college. You know a chapter of your life is closed and you”re waiting and waiting for the next to begin, and it seems endless. that was an incredibly insightful, lovely read. don’t ever fault yourself, your compassion and heart are obviously deep and generous and there’s never a reason to mourn or be chagrined about what you haven’t done. now you know and all too sadly that time begins with the next moment. the one that you can use to make your life better with The One, the moment you can use to maybe say hey to an old friend and move forward with them, and the moment to realize that working all the time doesn’t get you more or better – just takes you away from balance. you’re a beautiful writer, have a fabulous cookbook etc and lucky enough to have a love that matters to you – so forget sorry, just revel everyday in your life. every single day! Debra, thank you. I love your idea of the moment. It’s a good reminder, for us all. It just breaks my heart that it took Jennie’s loss for us to remember all this. What an amazing, poignant post, David! You don’t know me and I’ve never met you in person. But I follow and read you, and admire your work from afar…and life is just too short for me to not say so. Your message is so true. We are glued to our computers and devices too much, too long.There are far more important things in the world . Thanks for sharing this. I want to say more, but your article has me all choked up. I only met Jennifer Perillo once, at the ‘Eat Write Retreat’ in D.C. last May. She was special and amazing. She can make you feel like you’re the MOST important person in the world. What a gift she is to us all. Elizabeth, I’m so happy you met Jennie. I look forward to doing so myself. I’ve heard only lovely things about her. Such a thoughtful, mind-provoking post. So true – even when my 93-year old father-in-law died this past year, we were still left wondering, did we spend enough time with him, and was there anything we should have said that we didn’t. This past week, we dropped our son off to college and I felt strange. What if something happened and I didn’t see him again. What should I say. I made sure to say “I love you” as many times as possible. Sometimes those closest to us are not given nearly the attention they deserve. This tragedy that happened to Jennie and her girls has certainly put life in perspective. Regret is the worst, most haunting, of all emotions. It never leaves, it just stalks quietly. With Momma and Poppa Leite I constantly ask myself, “Am I doing enough? Should I visit more?” And the really troublesome, “Why do I have to stir the pot every time I visit?” I think if we take a long view of these relationships, we can see more clearly all that we have done–or not done. I try to think of life as a pointillist painting. Each moment is a dot on the canvas, seemingly insignificant. It’s only when we step do all this millions of dots converge to reveal the sum of our actions. Your words are few but say a world. I lost my dear, beloved brother two years ago (he was so young) and it changed our lives. We came to this same realization that life is short and nothing is guaranteed and we would all do better getting our priorities in the right order. My husband (who had also just lost his father as well) and I since have made a huge effort to change our life, to stop doing the “expected” if it makes us unhappy and gets in the way, to reach for what we really want and try and really live our life completely and to the fullest. And spend more time together and with our family, our loved ones, and our friends. Beautiful, beautiful words. I’m so sorry for your loss, Jamie, as well as your husband’s. Thanks for your reminder. It seems so many of us have experienced loss (or fear of loss) and have use it as a way of changing behavior. That probably is the best that can happen. There are lots of things that have happened recently to remind me time can be better spent away from the computer and work and rather with the ones that we love. Sometimes we forget what’s out there in real life, who we have been missing and the things we no longer get to do that bring us joy. I hope you are able to find that time as I hope to do as well. Sorry you won’t be at IFBC. You would have been a great addition to the speaking line-up. I really enjoyed your presentation at BHF in Atlanta. Gwen, glad to hear that you’ve had a lot of experiences that keep you centered and with your priorities straight. You’re a lucky woman. I’m sorry I won’t be in New Orleans, too. Would have been fun. David: Since I read the news of Jennifer Perillo’s loss, I have struggled to express all that I am feeling. As always you did it in a way that was moving, thoughtful, and thought-provoking. One of your best pieces of writing advice was to be as honest as possible. You did so here, in a way that honored Jennifer Perillo. I know how stressful it can be to be a single parent, to make ends meet, and yet how easy it is to get caught up in life’s craziness. But since I read her news, I have been trying to be as present as possible with my sons, to laugh with them and to hug them deeply. Finally, thank you for reminding all of us how we, as individuals and a blog community can help her. Thank you, Michele. I struggled mightily with this post, because I wanted to honor Jennie and her children. And I have to confess, this is my first real foray into helping my fellow bloggers, and I am blown away by the support, caring, and concern there is in our community. I have Shauna James Ahern to thank for getting me involved. We’re all Jennie Perillo. We just are really good at pretending we’re not. Thank you for this opportunity! I just donated. Thank you for donating, Sharon! David, your words weave such beautiful pictures that left me in tears. My mom is in the final phase of cancer, and I cherish every moment with her, looking at all the “things” that I will have left after she is gone. Every day passes so fast and tomorrows fly by with geometric progression. I “knew” Jennie from Twitter, and I am still crying thinking of her and her girls. Thank you for this powerful post that is going to inspire many of us to look more closely into the eyes of the ones we love. Gosh, this thread just makes me weep. I’m sorry for your mom, Lana. So good to hear you’re savoring every minute you’re with your her. One thing we did with a friend of ours, Lois, who died of cancer was to reminisce about all the good times we had, especially during those last few days. We wanted to burn those memories into our minds so they would always be there for us. Lana, “Life was happening without me.” Boy, can I relate. We have a slew of photos of parties I never attended. Sad, really. A friend of mine told me that she works up until 5 pm and never on weekends. When she made the shift, she found she had more experiences, more energy, more life to write about. Oh David, you really struck a chord there. This was followed shortly by the passing of a great friend’s dad which really drove the point home. So often I tell my kids to go and play so Mama can work, catch up on emails, etc. I go to bed late so I can get stuff done, long after hubby has retired, and I wake up crabby (though, to be fair, I’ve never been a morning person). Why? Good question, but no great answer. I had heard about Jennie’s plight, but because of this post I have made a donation that I hope will, in its own small way, help. And thank you for such eloquence and openness, and for reminding us what’s important. Vivian, thank you for the donation. and I’m so with you. I used to work long after The One went to bed trying to get more and more done. I woke up late (so I missed him before he went to work) and was crabby, too. It’s a vicious cycle. Wonderful post, David. I read it…and then I read it again. And as so many others have said, I would not otherwise have known about this donation effort. Kudos to you and Bloggers Without Borders. Darlene, thank you. It’s much appreciated. BTW folks, Darlene is one of our writers, and she wrote a lovely piece on cherry season and clafouti making. Hi David: Deepest sympathies to Jennie & her family. Life is frail and can pass away so quickly and without warning. You are hurting too, and have struck a chord with so many readers. Glad you took care of yourself today, that is always worthwhile. I’m glad I took care of myself, too, Elizabeth. I’m even taking tomorrow off and The One and I care going on a day trip. It feels so extravagant. ahhh…nothing like a day trip and a picnic. Bring the camera and be sure to capture it all. We travel alot and tend to take the trip for granted. Last month I participated in a “week in the life” program and we saw everything (especially our road trip ;) with different eyes. Roberta, camera is packed and ready to go! Thank you for making us realize we all need to make time for our loved ones. I reconnected with my sister-in-law because I’d been out of touch recently and didn’t even know she’d lost her brother earlier this month. I wasn’t there for her then, but I hope getting back in touch with her let her know that I care now. We do need to show those close to us, we care now, because we never know that it may be the last now we have. So well said, Lauralee, so well said. Some months ago, a dear friend in her early fifties died suddenly of a heart attack. She had been working like mad in the recent past at her newly-open restaurant–working late, waking up absurdly early, exhausting herself in every possible way. When she died, it was a shock for all of us, but also such a powerful wake-up call to reconsider our values and priorities, because nothing ever can be more important than love. You wrote about this so, so beautifully, David. Thank you. Thank you for this. A few days after Jennie’s life was so suddenly changed, I learned that a dear friend of mine slipped away, taken from his family and loving partner by the dreaded cancer that struck him a year ago. I was destroyed. The two losses hit hard, and I am just now coming out of it and able to think of both of these people without being paralyzed with tears running down my face. While I never met Jennie, I wish this didn’t happen to her and her children, and I feel so sad that I hadn’t had a face to face with my friend when our lives diverged–his move to Switzerland and mine to Argentina. We’d both been back for a while but never made the time to reconnect outside of email and Facebook and a Skype call or two. Your words, like the many others I read after Jennie’s loss, are a great reminder that it’s too late to say the things you want to a person once they’re gone. I read your piece twice and sent it to my friend with whom I always make lists to go see places, and do things! That is why I have to have a list and remind myself because it is so easy to get carried away with work and forget that “Work is just work, does not define the life and the person”… Or the stuff is just stuff! Thanks David… It was nice to meet you in person in Atlanta (though you may not remember, it was a brief moment) and have been reading your site, not commenting most of the time, but I wanted to make sure this time that you know you touched something in us. I have joined the auction crowd several days ago, and I will be donating as well. Ilke, thank you for writing. I checked your blog, and I do remember you–it was your being from Turkey that did it. I like your Bucket List. The One and I started to keep on, but it went by the way side. We have to resurrect it. Allison Parker, our managing editor, coined the term “Perillo Promise.” A Perillo Promise is a promise we make to loved one to take time out, to step away from our computers, desks, and office–and spend it with them. It sounds like you have a excellent list of Perillo Promises. Great, great piece. What a reminder indeed. David, what a poignant post. It hit home on so many levels. I’ve been trying to make more time for memories, but still way too little. Thank you for a push to continue to do more and to think about what truly matters. I hope to get to thank you again in person soon. Anne, first, I certainly hope we have the chance to meet up again, it’s been way too long. And I’m trying to uphold my Perillo Promise. So far, so good. The hurricane helped, in a perverse way. We lost power for almost three days in CT, and The One and I, and several friends who weathered the storm at our house, had such a great time together. It went a long way to creating more memories. —Dear David: I would like to make a small contribution for Jennie Perillo, however, I don’t have a pay pal account. May you please be so kind and let me know how can I find a check or money order to help? Thanks a lot. Hello Silvia, thank you so much for offering to donate. I’m not sure whom to send a check to, but I’ll into it. You can make a donation even with out a PayPal account. If you look at the bottom left of the PayPal page, you’ll see the message “Don’t have a PayPal account? Use your credit card or bank account (where available). Continue.” Click the continue kink and you can pay via credit card.